Congratulations to the DII Coed National Champions from Wilmington University! The Wildcats added another title to their collection at the 2019 UCA & UDA College Cheerleading and Dance Team National Championship. This team has hustle and heart that has driven them to win eight straight National Titles since 2012. The Wildcats showed up determined to take home the title for this program and all of their hard work paid off! When asked about how they prepare for the blue mat Ashley elaborates on “simulating the feeling of Finals during all practices and performances leading up to the actual day.” Doing this has paved their way to the top year after year. Opening up their routine with front handspring ups transitioning right into back handspring up immediate stretches really showcased the talent from the Wildcats. “The energy was great," said sophomore team member Caleb. "We are cheering each other on throughout the whole routine.” The fans felt the energy in the Arena as the Wildcats competed their incredible routine! 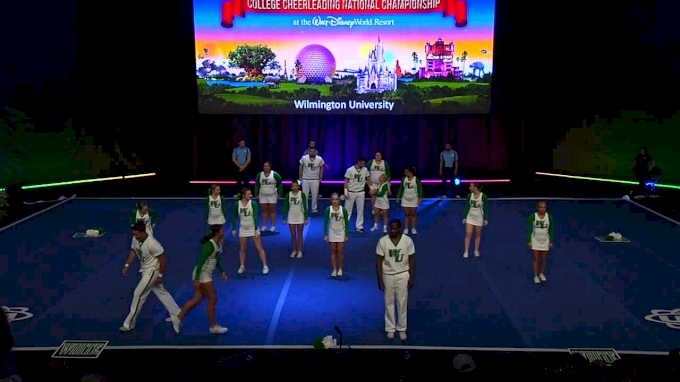 WATCH Wilmington University's Winning Performance! They have a tradition that starts in the warmup room to prepare them for Finals. They start with their ‘Wildcat Warmup’ and right before they go on stage they circle up and say the Wilmington chant seconds before taking the mat. Traditions are so important for this team because it helps keep a pattern, and in this case, a winning streak! The final teams are getting ready to take the mat tonight for the DIA Coed and All Girl divisions, so tune in to Varsity TV to watch the action LIVE!